Mormon feminism may seem to some a recent phenomenon, but events and writings in the history of Mormon feminism date back to the early 1970s. Here we have compiled these key moments in which Mormon women have engaged with questions about gender in the Church of Jesus Christ of Latter-day Saints in a timeline of the pre-history and history of the Mormon feminist movement. Featured image: Mormon women waiting to request to be admitted to the priesthood session at the LDS Conference Center in 2014. Photo by ordainmormonwomen, © Katrina Barker Anderson, CC BY-NC-SA 2.0 via Flickr. Hannah Wheelwright is a Programs Assistant at Robert F. Kennedy Human Rights, founder of Young Mormon Feminists, and a former spokeswoman for Ordain Women, an organization devoted to promoting the ordination of women in the Mormon Church. 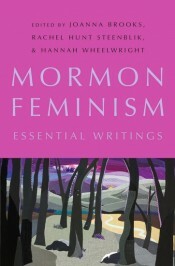 They are the co-editors of Mormon Feminism: Essential Writings. The establishment of Feminist Mormon Housewives and LDS WAVE could be included on this timeline, as well as the Pink issue of Dialogue and the Motherhood issue of Sunstone Magazine. Perhaps even the BYU Studies publication of A Mother There, the BYU Temple Studies Group hosting a conference on The Lady in the Temple.